And had THAT been the tenor of your talk the last week of June, most of us outside the Catholic Church wouldn’t have taken much notice. But talk about stepping over the line! Let’s start with these two quotes: "No one becomes Christian on his or her own! Is that clear? No one becomes Christian by him (or her) self." And then: “The Christian belongs to a people called the Church and this Church is what makes him or her Christian.” Excuse me?!? It doesn’t take much more than a cursory reading of the New Testament to understand that Jesus calls us to come to Him as individuals. Jesus said “I am the way, the truth and the life. No one comes to the Father except through me.” And the Apostles followed suit as they expanded the early church, after Christ’s ascension, by calling people into a relationship with God through the acceptance of Jesus. There was never any call to come to God through “the church” – there was no formalized church to go through. That didn’t happen until Emperor Constantine was converted around A.D. 325 and decided to unify Christianity, and then use it in an attempt to unify the Roman Empire. Until then, there was no Roman Catholic Church. Certainly, the teachings of the New Testament promote the Church as the Body of Christ when it gathers itself together. In fact, Jesus said: “For where two or three gather in my name, there am I with them.” And we are definitely encouraged to meet together for the purpose of spurring each other toward love and good deeds (Heb. 10:23-25). But your pronouncement that we do not become followers of Jesus Christ FIRST as individuals (confessing our own specific set of flaws and needs) is absolutely ludicrous . . . and un-biblical. But that’s not enough, as you go even further to assert that the “Church” is what makes us Christian. Again, even a cursory reading of the New Testament reveals that statement to be scriptural nonsense. We are not Christian because we are members of a church any more than we are automobiles because we happen to be born in a mechanic’s garage. Time and again, the writers of the New Testament explain that the way to God is through a relationship with Jesus Christ. And that the Church is the gathering together of those who have individually accepted and follow Him. That the purpose of coming together is to worship Him collectively; increase one another’s faith; inspire each other to strengthen our personal relationship with Him; encourage each other toward good deeds; and to be a model of love to non-believers. And when non-believes come through our doors, our job is to FIRST point them to Jesus, as He is the only way to get to the Father (His words). But let’s get to another of your statements. You said: “there are those who believe they can maintain a ‘personal’ and ‘direct’ relationship with Jesus Christ outside the ‘mediation of the Church." I’m especially liking the phrasing here because, like a good politician, you’ve managed to say something that “seems” true on the surface, yet hides a key element. As I stated in the previous paragraph, the New Testament writers definitely encourage us to participate in the collective gatherings of other Christians (Church). But you’ve added some intriguing language in your statement – “outside the mediation of the Church.” I realize that Catholicism promotes the role of the priest as the intermediary between God and men – much as it is portrayed in the Old Testament, and even in Jesus' day prior to His death and resurrection. I also, however, read the New Testament and understand the symbolism of the curtain in the Temple being torn in two when Jesus died on the cross – that His sacrifice circumvented the Old Testament need for human priests, as He became the ultimate High Priest mediating between us and God the Father (Heb. 6:16-20). In fact, Paul’s letter to Timothy states “For there is one mediator between God and Man; the man Jesus Christ" (1 Tim. 2:5). So your use of the term “mediation” in your argument is very interesting in its lack of explanation. To mediate is to function as an intermediary between parties – to reconcile differences, bring about an agreement, create a compromise, or even convey a message. Given that Jesus has already offered the ultimate sacrifice (replacing the need for Old Testament type sacrifices), stated that He is God (as part of the Trinity), and calls all men to come to HIM (Matt. 11:27-30), not the CHURCH – what exactly do you propose the Church needs to “mediate?” The writers of the New Testament give many insights as to the purpose of the Church, but a summary reveals Jesus is the Head of the Church; we are called to the collective worship of Him; we are called to encourage, instruct, admonish, and even discipline each other toward maturity in our (personal) relationships with Christ; we are called to be examples of His love, grace, and mercy to non-believers; and each of us is given spiritual gifts that we are to hone and use to accomplish all the above. So, again, what exactly do you mean when you say “outside the mediation of the Church?” Without further explanation, this phrasing comes off more like a parent telling a child "do it because I'm your Mom, and I said so! ", not because there's any real logic or evidence to back it up. As is, it can be misconstrued, and even twisted, for the purpose of making it mean anything you want it to mean depending on the circumstances – which Church history has proven to be true, many times over. Adjacent to that is your vague remark that the belief that a personal relationship with Christ is possible outside the mediation of the Church “is a dangerous and harmful temptation.” Okay, that’s all well and fine – I can certainly see where you might be going with that remark. But where exactly are you going with it? To whom is that belief dangerous and harmful? The believer . . . the Church . . . non-believers . . . the government . . . their family . . . other believers? And why is it dangerous and harmful? What precisely do you believe this temptation leads to? “Dangerous and harmful” is a very ominous phrase, and your use of it – without further detail – smacks more of scare tactics rather than genuine instruction that is accompanied by scriptural explanation and facts. You state when someone says “I believe in God, I believe in Jesus, but I don't care about the Church” that this is not good. But you don’t broach the subject of why they say that. And by not putting that statement into context you willingly overlook your Church’s participation in the birth of their frustration. Your parishioners are telling you that YOU have betrayed their confidence in your Church . . . that YOUR Church’s willingness to turn a blind eye to the outrageous and harmful behaviors of your priests over the past 100 years (or more?) is proof that YOU can’t be trusted to put your own house in order. Your demand for loyalty and faithfulness to the Church has become hollow because YOUR Church has proven itself to be “stiff-necked” in response to its own abusive behavior. You openly point a finger at those who make this statement as if it has come from out of left field – that its’ inception is somehow unrelated to the Church’s behaviors and attitudes toward its parishioners. And your opinion of those who make that statement is the ultimate in hypocrisy and self-righteous arrogance. Finally, in an interview with an Italian newspaper, you’re quoted as saying that the United States has “a distorted vision of the world” and must be ruled by a world government as soon as possible “for their own good.” Additionally, you’ve stated your belief in the need for a one-world government (with FULL control) to combat issues such as climate change. So, now you believe you are the final authority on “how” the world should be viewed? That you stand head and shoulders above the rest of mankind as the only person who sees this world as it should be?!? Your remark is almost naive: of course the U.S. has a distorted view of the world – EVERY country has a distorted view of the world just as every PERSON has a distorted view of the world – because NO ONE (including you dear Pope) has the ability to fully understand everyone else’s circumstances, and therefore see the world with “clean vision.” We have all been raised in different socio-economic environments, with different religious beliefs, and different traditions, that all play into how we view the world around us. Your demand that the U.S. needs to be “reined in" simply because you don’t agree with their world view is amazingly short-sighted. 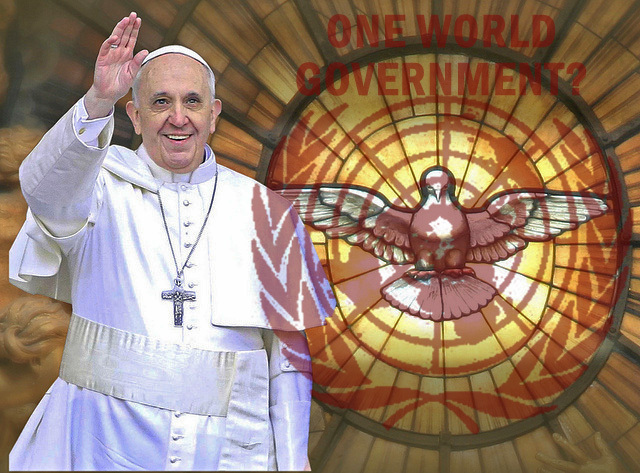 But your push for a one-world government is actually scary. I presume you’ve read the New Testament book of Revelations? Are you simply attempting to posture yourself (and/or your Church) to be aligned with such a government for the purpose of power and control? After all, this wouldn’t be the first time in history the Catholic Church tied itself to a reigning monarchy and enjoyed the spoils of that relationship. Or are you simply “helping” the world get to the circumstances of Revelation sooner for the purpose of Christ’s return? Either way, I urge you to FIRST evaluate your own house and make the necessary changes that will garner the loyalty and trust you have lost from your parishioners over the years. Once you have accomplished that, then take a close hard look at whether Jesus would view your Church in the same way he viewed the religious leaders of His day. Have you turned His Temple into a house of money-changers, mediating your followers’ desire for a relationship with God in exchange for money, power and control? Do you point your followers to Jesus as the only way to God (as stated in scripture), or do you assign yourself the position of mediator between God and mankind? Will you continue to willingly turn a blind eye toward your Church’s shortcomings – blaming external factors for your failures – or will you re-earn the loyalty of your parishioners by openly admitting your failings, seek forgiveness, re-evaluate your purpose, and make the difficult modifications to your internal culture that will warrant reconciliation?